Medigrity’s mission is to bring the three core Healthcare stakeholders – Medical Practitioners (Healthcare Service Providers), Healthcare Service seekers and the Medical / Surgical industry’s infrastructure products & service providers – together, so that each of them can make better decisions beneficial for themselves and the community too. Medigrity uses World Wide Web / internet as a medium for better communication methodologies, extensive knowledge and information sharing and better decision making. Medigrity’s vision is to be a pioneer in providing various internet based platforms that enriches each of the stakeholders in the core Healthcare segments – both Healthcare service providers and Healthcare service seekers. Healthcare industry has drastically changed for the better with the advent of World Wide Web / Internet, compared to what it was a decade or more ago. 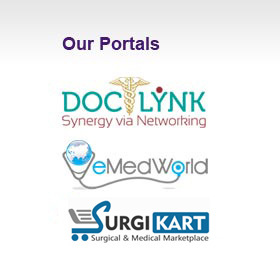 Medigrity’s goal is to synergise the Healthcare industry as an integral whole. Medigrity strives to enrich and empower the major decision making participants of Healthcare Service industry, without compromising on our core values – Integrity, steadfastness and our quest for excellence. We always innovate and reinvent ourselves to provide the best satisfaction to the participants of Healthcare Industry.